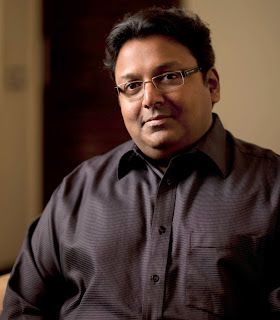 Ashwin Sanghi, the best selling author of The Rozabel Line and Chanakya’s Chant, talks to Literary Analyst Kirtana Krishnan, about his highly anticipated forthcoming release-The Krishna Key, the more organised Ashwin, and a rather curious shoe shopping incident. ! K.K; Getting down to brass tacks, what, is India’s current crop of reader obsession with mythology, which, whether by chance or design, does not venerate religion - symbolic of? A.S; The popularity of historical and mythological novels is related to a change in the Indian psyche. Until the Eighties, we looked to the West for our inspiration. This began to change in the Nineties and came into its own in the twenty-first century as our nation became more confident of itself. I see the rekindling of interest in Indian history and mythology as a quest by the average Indian reader to be entertained and educated in parallel. K.K; Unlike its more famous European and Asian counterparts, why in your opinion has Indian mythology never made it big globally? A.S; Any creative work must be appreciated at home before it can be appreciated globally. Have some patience. Fifty years ago, who could have predicted that Yoga, meditation or Vedic philosophy would ever catch on in the West? They did. K.K; That writers don’t have a pot of ideas is well known. It generally comes in bursts that need to be built upon. What has this process been like for you? A.S; Ideas strike me all the time. The problem with most of us is that we tend to ignore or forget our best ones because we happen to be caught up in life’s myriad issues. I maintain an idea bank and I email anything that constitutes a good idea to myself whenever and wherever the idea occurs. It could be something I’ve seen, in which case I endeavour to take a picture of it and email it to myself. It could be an interesting quote that seems appropriate for a future story idea. It could be an article that I have read online, in which case I email the link to myself. As a result, I always have a bubbling pot of ideas from which to pick and choose for any project. K.K; Tell us about Krishna Key and your protagonist. Do you see him reappearing in future novel, Robert Langdon (The Da Vinci Code, Angels &Demons) style? A.S; The protagonist is a historian, Ravi Mohan Saini. He is a simple college professor who finds himself pitted against extremely powerful forces that wish to prevent him from reaching Krishna's legacy so that they may claim it for themselves. I work on a book for eighteen months at a time. During that time it becomes my very life. But once I'm done writing a book, I get bored with the story and characters. I then need to find a new topic of my interest. So, the answer to your question is NO... I do not see my protagonist reappearing in future novels. K.K; How different has the writing of The Krishna Key been for you? What have you observed about yourself? A.S; The Krishna Key is my third book. I see a tremendous change in myself as well as the approach with which I tackle a new project. These days I spend months on getting my plot mapped in fine detail so that I know the entire story before I actually start writing. This is in stark contrast to the disorganized Ashwin Sanghi who wrote The Rozabal Line from his gut. I have also become much more disciplined and I force myself to sit down and write even on days when the words do not flow easily. Most importantly, I have become unemotional about deleting or ignoring material that does not work in the context of the story. I have realized that people read my books because they want a story that will keep them turning the pages. I must never compromise on that particular quality. K.K; Since writing is the inward fusion of external amalgamates, would you consider the art of writing to be a spiritual journey? A.S; Oh absolutely! When I sit down to write at the end of a long day at work, it is my way of escaping the real world. I get lost in my fictional construct. My best writing occurs when I allow the words to emerge with no apparent conscious effort on my part. I genuinely believe that my finest writing has been through me but not by me. Creative expression is a spiritual blessing and one must continuously remain aware of the fact that it is the Creative Muses that keep us going. K.K; How taxing is research and its various tangents? What is to you the most difficult part of writing a book? A.S; The easy part is the research. The most difficult part is getting the plot structure finalized. Writing the story after the plot has been frozen is also rather easy. I usually devote my first six months to research, another six months to plot development and a final six months to the actual writing. K.K; Writing is by and large a lonely and poor profession. What have been your experiences of the same? On the flip side, is it also not true, that it is the silent help of one’s family in the background that allows writers to pursue their dreams? A.S; Writing is indeed a very lonely activity. But, if I had not been a writer, I would have probably ended up a hermit! I have always been a loner and, at some level, I think all writers are a lonely lot. But writing does not have to be a poor profession. Today’s book volumes, royalty structures and movie deals are adequate to manage a fairly comfortable life. But yes, it takes several years to reach that point. Family support is crucial in more ways than one. My wife has tolerated my absence very regularly… she never complains although I know it does irritate her at times. K.K; Is the adage true- that you need money to make money? A.S; Nonsense! Dhirubhai Ambani, GD Birla, Jamsetji Tata, Oprah Winfrey, JK Rowling, Sam Walton and countless others had very little before they made it big. K.K; Does the Indian publishing industry confer its fifteen seconds of fame to easily on individuals with an IIM/IIT degree purely for its sheer marketing value? A.S; Not anymore. You have around ten thousand graduates emerging from the hallowed portals of India’s IIMs and IITs each year. We should have seen several thousand bestsellers if this were true. The reality is that author marketability is of little relevance if you are unable to connect with your readers. You can either tell a good story or you can’t. No amount of self-promotion or marketing can make up for that. K.K; Where are we lacking in our literary standards? Or is the chalta-hai attitude pervading Indian writing as well? A.S; I find that basic editing is often overlooked in Indian titles. Whose fault is it? The writer’s or the publisher’s? In my opinion, it’s much more the fault of the publisher who allows a shoddy piece of work by a first-timer to be stocked on bookshelves without having been subjected to the discerning eye of an experienced editor. K.K; If it is the pattern that repeats and not history itself, then could you summarize a hypothetical future for us? A.S; My very existence is hypothetical. I don’t know if I exist. Why discuss a hypothetical future when one isn’t sure of the present or the past. K.K; What do you think entails the psychology of a writer? A.S; Ask that question to a real writer… someone like Arundhati Roy, Amitav Ghosh or V.S. Naipul. I am just a humble paperback writer… an author impersonator. There is no psychology that drives me. Usually it’s just a peg of whiskey! K.K; Are eccentricities a precursor for creativity or the other way around? A.S; Once again, I must differ. There is nothing remotely eccentric about my life. I have a wife and kid. I go to work Monday to Friday. I try to work hard and do my best to be a good husband and dad. In whatever remaining time I have left, I try to write. Where’s the room for eccentricity? Most anecdotal evidence about the eccentric behavior of writers is manufactured for the sake of good PR. K.K; What has the been strangest writing episode place for you? A.S; I was with my wife at a mall and she stopped at a shop to look at shoes. I was tired and sat down on one of the chairs that are mercifully left for customers to try on their footwear. My wife ended up taking an interminable period of time during which I churned out around a thousand words on my Blackberry! K.K; How involved are you in the creation/suggestion of your book covers? How important are they to you? A.S; Very. A book cover is the very first call to action. It is your personal billboard. Why would you rent an expensive billboard and then put something boring on it instead of something exciting and eye-catching. The cover of The Krishna Key took over six weeks to create and went through multiple rounds of creative debate. A good book cover can never be a substitute for good writing but assuming that one has a good story, it is all the more important to get your readers to notice it. K.K; If you had to choose between the guidance of a skilled editor and a readership based focus group for your forthcoming ventures, which one would it be? A.S; I would never seek guidance from my editor regarding a story idea. On the other hand, I would never attempt to get a focus group to edit my work for me. Frankly, I believe that writing is something that emerges from within. The moment you start writing stories that are driven by others, you run the risk of losing your own creative spark. K.K; India bashing- publicly, amongst the financially secure so-called intelligentsia, with a certain desi-author at its helm, seems to be the latest society fad. Genuine complaints or illusionist intellectualism pandering in self-serving righteousness? When and where does one draw the line between authentic misgivings and anti patriotic rants? K.K; I rarely watch the news. I used to read five newspapers in the morning. I cut it down to just one. I remove all the supplements and just skim through the headlines of the main paper. My business takes up over forty hours each week and another thirty hours is devoted to my writing. I have no time to see who is saying what about anything. Given the proliferation of news channels and newspapers, they all sound the same. K.K; Why are they so few Indian political thrillers? Fear of backlash perhaps? A.S; The reason that there are so few political thrillers is because the overall thriller genre is very sparsely populated in India. For the longest time Indian writers were urged to churn out poignant tales of three generations and stories of yearning and lost love. For thrillers one had to rely on western writers such as Frederick Forsyth and Robert Ludlum. It is only since the Nineties that the Indian thriller genre has begun to develop. Give it a few more years and you will have many more sub-genres including historical thrillers, political thrillers, spy thrillers and terrorism-inspired thrillers. K.K; If you could live in another era which one would it be? A.S; My wife claims that I’m ancient. If I answer that question it will reaffirm her view. I’m not going down that road! K.K; If you had to cast one actor to play you in a movie whom would you select? A.S; Govinda. His earthiness and rustic charm reminds me of myself. K.K; What’s the strangest question you have been asked? K.K; This has been fun but on a final note, if there is one query you wish you had been asked but never were, what would it be? Consequently, what would be your response? The question would be-, Shall we end the interview here? Indian Online shopping market is achieving great heights in small period as more number of people indulging in Online shopping .